A new rendering of the 777-foot high supertall tower being developed by Ian Bruce Eichner has just been released by the project’s architect, Kohn Pedersen Fox Associates. The image, first spotted by Curbed, offers us a street view of the 83-unit condo (previous reports noted 80 units) at dusk. Eichner’s new project will sit at 45 East 22nd Street rising nearly 60 stories above a five-story, 50-foot wide stone base. There’s no denying that this project is tall, and Eichner’s project in fact accumulates air rights from neighboring properties to augment its size — including air rights from eight adjacent lots to the west and north and the assemblage of One Madison. Eichner reportedly spent more than $100 million to assemble the site. 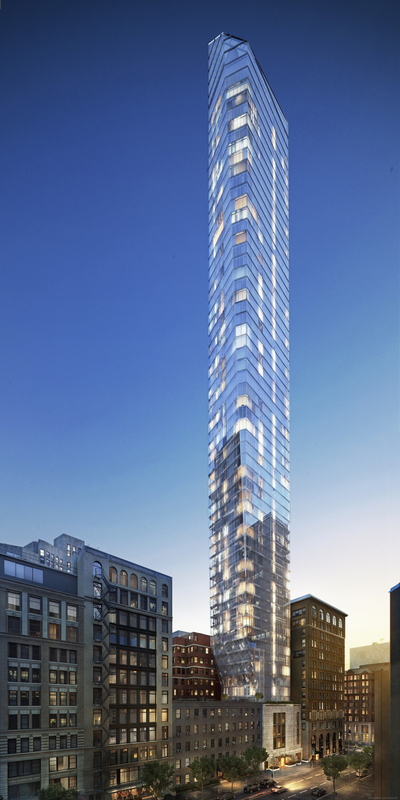 This new rendering certainly lends a hand in convincing the public that this massive tower will blend seamlessly with its environment (seen in the building’s apparent ability to reflect its surroundings to a T). In reality, when completed, the tower will not only dwarf its neighbors to a near microscopic scale but trump One Madison by 157 feet. We last reported that demolition began at the end of April. Sales are anticipated to launch this fall, and tenants will be able to move in by 2016.